We're going to switch up Repack Wars, leaving the green grass and heading to the cold ice with this box. I have posted a couple packs of this over at APTBNL and I said I would do a repack war on the box, so without further delay, let's see how my $13 (Target 10 pack repack box) was spent. Standard repack wars rules apply. We begin with 08-09 OPC. Now, as opposed to the baseball OPC I get in repack boxes, I don't mind the OPC brand so much. 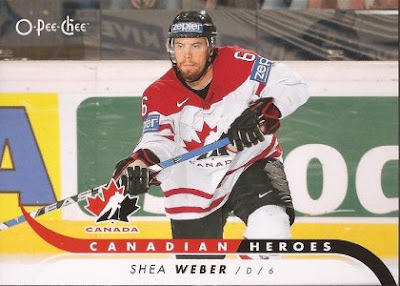 This pack had a lot of no one in it, so the nod goes to the retro insert. 09-10 Upper Deck. SHOOOOOOOOOOTER! A couple nice cards in this pack, but Sharpie wins by default. The font on this set, though, is weird. Too small? Bad choice? Just something doesn't work. OPC from 09-10. 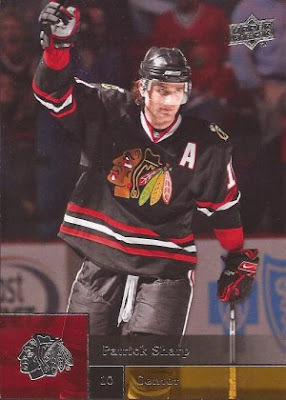 Even with the ads on the uniform, this is a pretty insert card. 2008-09 Upper Deck. 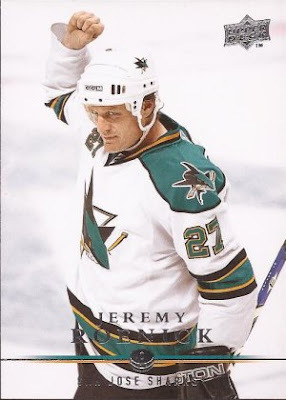 Now, I did have a Blackhawk in this pack with Seabrook, but I am going to go with the ex-Blackhawk Roenick for the winning card. He will always be in the Indian Head in my mind. The lower end of Upper Deck's 08-09 offering with Victory. 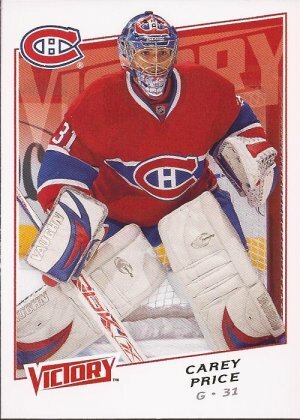 I skipped past the Malkin, the Tanguay and the Kesler to settle on a nicely framed shot of Carey Price. Take away a card I will be posting soon, this is the winner of the box. This came from a pack of 1991 Sportscards Ultimate. See more of the cards at this APTBNL post. 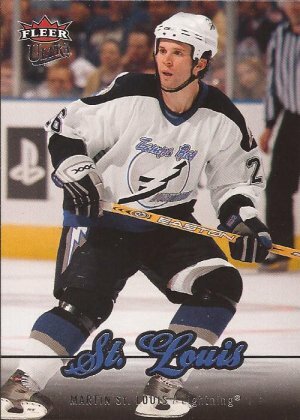 I have found Scott Niedermayer's mailing address for TTM requests and this card will be mailed soon. I hope I get it back. Just like their baseball cousins, this 07-08 Fleer Ultra features some stunning images. The insert of Doug Weight doesn't get the win, though, because the gold background looks like crap. So no - the Sedins don't get one word of praise here at 2x3 Heroes. Moving on. A rack pack from 08-09 Upper Deck. LOTS of nice cards in this pack. had to go with this amazing card of Backstrom fighting off a shot. 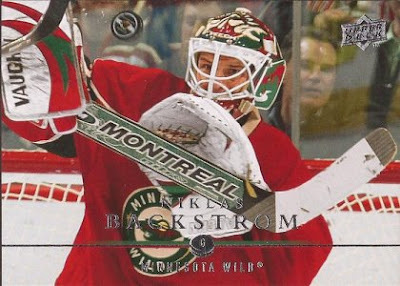 You have the puck, his mask, nice close up - stellar. Dual autographs! 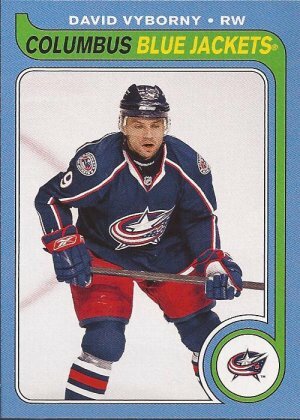 Andy McDonald never played with the Ducks, getting a few years with the Islanders and is now in Europe. 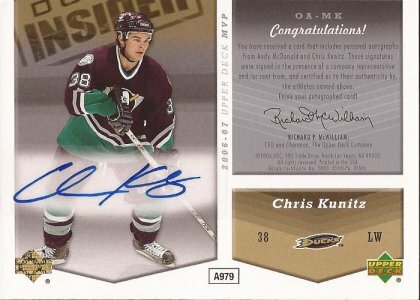 Kunitz is now a Penguin. Both are sticker autos, but a good hit in my book. You're confusing Andy McDonald with Andrew MacDonald. Oh, and I'd like to trade for the Ducks' Dual Auto please, if it's available. 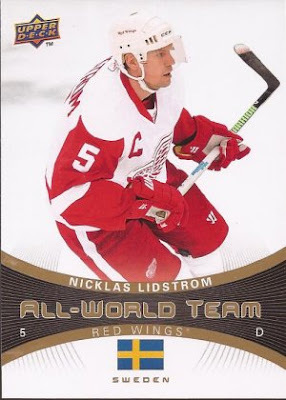 Sweet job on landing an auto in a repack...that is nearly as tough as winning a lottery! Dual-sided autos.. don't see those often!